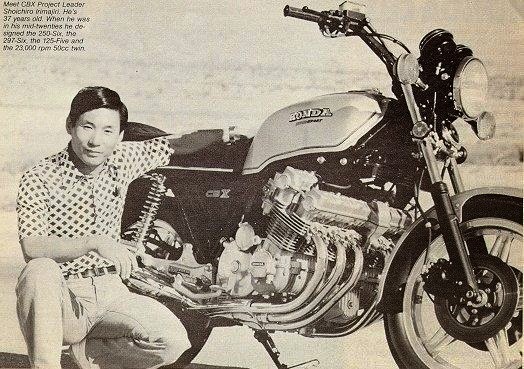 "When I was at Tokyo University, I learned that you could use the intake manifold to increase the inertia of the air to the cylinder and supercharge the cylinder by 20-30 percent. Based on this theory, I invented some variable valve timing utilizing hydraulic systems and the variable length of intake pipes - technology that is being used right now. At that time Honda had the largest analog computer, and I went to them to prove my calculations. I got a lot of information utilizing that theory and designed a 1.5 liter Formula 1 engine for my graduation project. I was motivated to join Honda's racing department in 1963, when there were only 10 engineers. My first assignment was to tune up the RC113' because this 50cc engine was the weakest in the class against the Suzuki, Yamaha and Derbi two-strokes. I changed the ignition, intake and valve timing, manifolds and exhaust pipes - EVERYTHING - and got it to produce 10.8 horsepower at 21,500 rpm. Luigi Taveri won the Japanese GP on the bike that year. I was then assigned to design the next 50cc racing engine, which eventually became the RC115 that developed 12.8 horsepower at 22,000 or 23,000 rpm. In 1965 that bike won five of seven Grands Prix and the rider and manufacturer championships. I was then asked to design and develop the five cylinder 125cc engine for the RC149 and the crankshaft, gear train and valve mechanics for the six cylinder RC166. Mike Hailwood rode the 166 to consecutive world championships in 1966 and 1967.